My database was originally set up to permit the user to enter data into portals on the first page. All was well. : Now, after adding some additional portals for the same purpose, I cannot enter data into the new portals. I cannot click on the fields in the portal, nor can I tab to them. The fields simply will not accept entries. I set them up just like the originals that function fine, but the new ones are not functioning the same. 1. 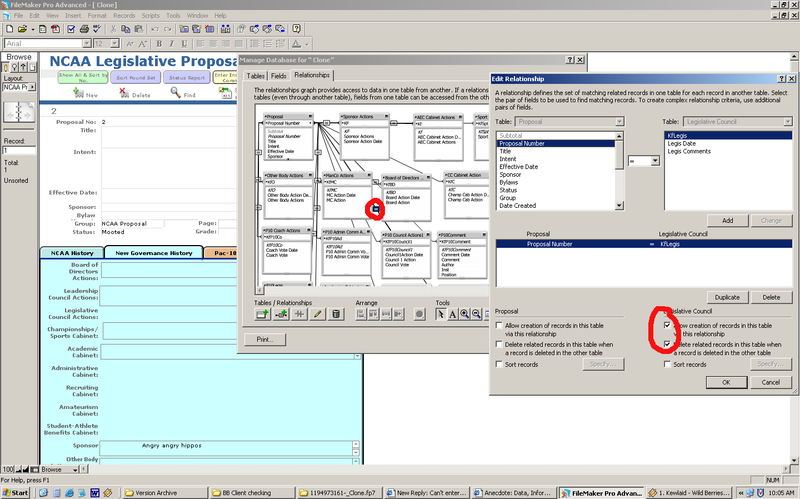 You have "Allow Creation of Related Records" on in the relationship (Edit Relationship on the Graph). 2. You have field behavior to allow entry in Browse Mode. I appreciate the answer! Thanks. But, the portals I had created before are not set to create related records--and yet they allow me to. So, it doesn't make sense that the new portals I am creating opperate differently. Field behavior is set to allow entry in Browse Mode also. Can you think of anything else that might be tripping me up? But, the portals I had created before are not set to create related records--and yet they allow me to. Can't be. You can only create records in a portal if the table occurrence that the portal is based has "Allow Create" in its relationship. Please post a clone. Will do on Monday--is that okay? I currently am traveling and can't get access to the in-house server where DB is hosted. Attached is an archive file of my DB. When you toggle between the two blue tabs on first page you will see the old portals which do allow me to enter data (NCAA History), and the new portals which do not (New Gov History). Actually, the relationships between the TOs that your old portals represent do have "Allow creation" on, while the new ones do not. I turned on allow creation in each TO under "New Governance" and they allow entry. Then I guess I do not know where to set to allow creation. Is it in the Relationships Table? In define database under relationships. Just double-click on the join symbol (or even just the line)between two tables. The logic follows that you will want to allow creation on the many side of the relationship and you will need to decide if you want to automate deletion when a parent record is deleted. You don't want to have orphaned records but you also may not want to be able to wipe out your data with cascading deletes across all your tables. That all depends on your business logic. Appreciate your help. Have a great week!